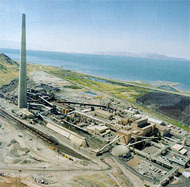 The expanded and modernized Kennecott copper smelter near Salt Lake City. Thanks to its inherently low sulphur emissions and low operating costs, flash technology is gaining ground as the smelting industry keeps reducing emissions and increasing capacity. Kennecott-Outokumpu flash converting sets a new industry standard. Smelters are vast producers of sulphur as a by-product of metals production. Depending on the grade and type of ore, copper smelting actually produces somewhat more sulphur than metal. The sulphur is released in the form of sulphur dioxide, the amount of which is more than double that of metallic copper. If released into the atmosphere, sulphur dioxide causes major environmental pollution. Consequently, public pressures on the industry are growing throughout the world to capture the sulphur dioxide. The standard in most countries of the world will soon be practically complete sulphur capture - in some countries it already is. According to CRU International, an independent consultancy based in London, almost half of the world copper smelters capture 84% or less of sulphur, and 10% capture none at all. Most of these smelters with low or no sulphur capture are located in Australasia, South America, Africa and Asia excluding Japan. This record of sulphur capture clearly spells out a vast need for modernization to comply with increasingly strict environmental standards. At the same time as the copper smelting industry contends with tightening emission limits, economical constraints push smelters to increase capacities to remain competitive. Larger production output further increases demand for an efficient solution for emissions control. Cited as the most significant metallurgical breakthrough of the 20th century, Outokumpu flash smelting is a closed process which can achieve up to 99% capture of the sulphur-rich gases from the smelting furnace for the production of sulphuric acid. The technology was first introduced at Outokumpu's Harjavalta smelter in Finland in the late 1940s. Thanks to flash smelting - as well as optimal process configurations and a novel Outokumpu-developed nickel process - Harjavalta is today among the world's cleanest copper smelters. After the smelter's extensive expansion and modernization in 1993-96, which increased copper smelting capacity by three-fifths and doubled nickel smelting capacity, sulphur emissions were reduced to approximately 10 kg per tonne of metal. This represents over 99% fixation of sulphur. Kennecott replaced three smelters and four Peirce-Smith converts with one flash smelting and flash converting unit, nearly doubling capacity and reducing emissions to a fraction of the previous levels. The Harjavalta smelter is a good example of the minimal environmental burden of nonferrous metal smelting when the smelter applies the best available technology. According to Statistics Finland, industrial production accounts for 53% and energy production 35% of the total Finnish sulphur dioxide emissions. Smelting of nonferrous metals at Harjavalta represents 4.7% of the industrial sulphur dioxide emissions and 2.5% of the total emissions in Finland. Located in a country of only 5 million inhabitants - less than 0. 1 % of the world population - Harjavalta produces about 1% of the world copper and 4% of world nickel. Out of 26 smelters in the world classified by CRU as high sulphur capture smelters, 17 utilize Outokumpu flash smelting. Approximately 50% of all primary copper in the world is already produced with the technology, and the percentage is on the rise. It is estimated that without flash smelting, the annual world sulphur dioxide emissions would be 5 to 10 million tonnes higher. Converting, an integral part of the copper smelting process, is the removal of impurities by blowing air through molten copper of low purity. 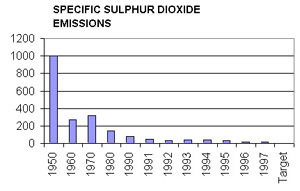 The biggest problem area in sulphur-dioxide emission control at smelters arises from converting which utilizes rotary side-blown converters (Peirce-Smith converters) and the transfer of molten material in ladles, both open processes which release off-gases including sulphur dioxide into the air. Joint R&D efforts by Kennecott Corporation of the USA and Outokumpu have produced a novel converting method, flash converting, which eliminates these problems of converting. Flash converting closely resembles flash smelting. Above all, it is a closed process and, consequently, off-gas emissions can be efficiently controlled. Flash converting had its first application in the expansion and modernization of Kennecott's copper smelter near Salt Lake City, Utah, which was implemented during 1992-95. Coupled with flash smelting, the technology has offered a solution to strict new environmental regulations in the state of Utah. At the time when Kennecott was weighing alternatives for expansion, the smelter's maximum permissible sulphur emission was decreased to 982 tonnes per year from the earlier 16,850 tonnes. Other limits for emissions to air were also lowered significantly. The previous technology utilizing three smeltering furnaces and four Peirce-Smith converters was hopelessly incapable of meeting the new requirements. Based on Kennecott's patent, Outokumpu and Kennecott had been conducting flash converting pilot tests since 1985 at Outokumpu's research facility in Finland. Assured by this research that the new technology fulfilled its promise, Kennecott proceeded to reconstruct its Utah smelter, replacing the old furnaces and converters with one flash smelting and flash converting unit. This single unit nearly doubled previous capacity. Kennecott's flash smelting and flash converting process reached full capacity utilization in 1997 after Kennecott completed the construction of an Outokumpu Wenmec anode casting shop at the smelter. The smelter has met its design values for emissions and, in some cases, performed even better. Sulphur fixation is 99.9%, which makes the Kennecott copper smelter the cleanest in the world. Reprinted from Outokumpu News February 1998.